I hate the the Keyboard Indicator applet on my Fedora/GNOME desktop. My (physical) keyboard, as virtually all keyboards sold in my country (Romania), has an US layout. And I, as a large majority of people around, write without diacritics (ă, â, î, ş, ţ). Except in the cased when I really need diacritics or the euro symbol (€). So I have to change the keyboard configuration, and for my own use the "programmers" version of the Romanian layout (the default Romanian layout in Fedora) is the best: it is identical with the US layout, so the print on my keys remains usable and I get diacritics with AltGr+a for ă, AltGr+s for ş, AltGr+e for € and so on. Which is nice. But I still hate the applet. As shown in the screenshot above, the applet display a text, "Rou" in my case, instead of flag icons. While I know the argument why the flags were replaced with text a long time ago and it make sense (flags are symbols for countries, which represent political entities, not languages and their use may get you into nasty nationalistic conflicts), I sincerely don't care. I want pretty pictures, my desktop to look nice, with icons on the panel, not with boring text. So the best option for me is to stay with one single layout and not use the applet at all. I used to argue for the flags, as I believe we should grow up and get past those artificial issues, here is an example: using a Hungarian flag at a public event in Romania in 1990 was absolutely inflammatory, today we grew up as a community and people do not react seeing those flags displayed. But some happenings in the Fedora land made me see the issue from the other perspective and have a first hand understanding of why country-based communities are not such a good idea, so I have now something to put in balance. I worked recently on a small graphic for the Fedora community of Moldova and I tried to find some way of collaboration with our Fedora Romanian community. I ended by not finding any solid bridge, as they have almost all the valuable content in Russian, but it was an invaluable opportunity for me to contemplate this strange animal: a tri-lingual website, with a short English introduction, a lot of Russian content and some Romanian content. I wonder what is the purpose of such a website? 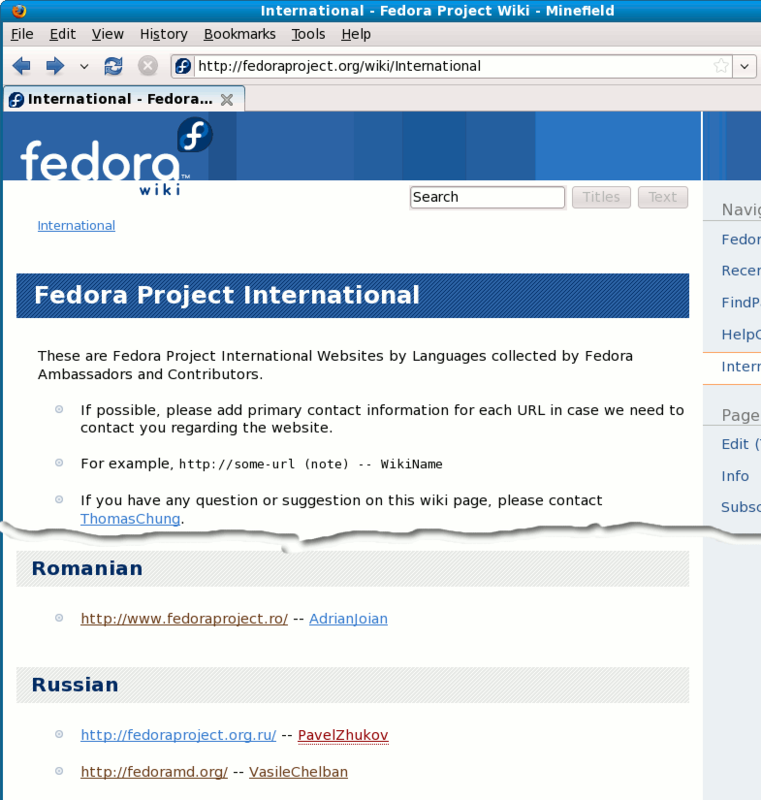 People searching the web for Fedora content in Russian will land in a Russian website, people searching for Romanian content will land on a Romanian site. If they will open a forum, what's the point for an user to join that forum instead of going to a larger Russian or Romanian forum? This is, IMO, the best example for the futility of a country-based community. There are other things that are wrong with this community; such as the fact that discussions are carried out on a closed site which is not available to the general public (one needs an account on a local torrent tracker). I agree with your arguments, absolutely. I guess it's a feature of the people of Moldova - some of us feel comfortable with re-inventing the wheel every now and then, when there are already plenty of good wheels on the market. Ah, I forgot about the primary objective of your article. I don't like the 'Rou' thing either, it feels like a typo to me (either that, or I must accept that the world we live in is a francophone world). @Alex: considering their website uses Russian as the primary language, it is natural they are listed there. 'Rou' is just a stupidity, someone probably thought 'Rom' is to close to Romani (gypsies), used francofony as a pretext and pushed a French abbreviation.